Reading has always held significance for me. I remember being completed consumed by the Malory Towers series as a child (God bless Enid Blyton), and before that devouring anything written by Lucy Daniels. Remember 'Kittens in the Kitchen' and 'Ponies in the Porch'? Ob.sess.ed. Side note: I have just stumbled upon something quite shocking. Lucy Daniels - not a person! Instead, she is the genius marketing ploy of two American men. Read this article for your world to be shattered, too. Back to the nostalgia. I still remember that moment of being given Harry Potter and the Philosopher's Stone for my tenth birthday (thanks, Holly and Jessie) and becoming completely enraptured in an alternate reality where witches, wizards and secret cobblestoned alleys housing all your magical needs seemed entirely believable. And, that, right there, is the joy of reading. The suspension of reality - if only for a short while - whilst your consciousness becomes completely submerged in a new world. Blissful. Then you grow up, and life gets in the way. Right? I have so many books in my to-read pile it's getting overwhelming! And whilst I have the best of intentions, life just gets so busy I don't seem to be able to read as much as I'd like. I still love reading and am in two bookclubs - one with friends locally, and one which I started at work. This has meant, however, that my personal reading choices often get pushed further down the priority list as I struggle to meet the demands and time restrictions of my book club reads. On average, I read two books a month - give or take. And of course, when the summer holidays come around I can become a reading machine; all those lovely lazy afternoons spent with a good book in the garden or on holiday. For me, those days are blissful. So I thought I would address that question that so many of us with busy lives face; how to read more? This is something I have been so guilty of in the past - reading books because they're having a moment and everyone else is banging on about them. And more often than not, they've turned out not to be for me. The Miniaturist by Jesse Burton - nah. White Teeth by Zadie Smith - I just couldn't get going with it! So my advice would be to read the blurb of said 'must-read' and see if it speaks to you - are you still desperate to read it? If not, don't waste your time. I listened an episode of The High Low recently where they referred to 'culture overload' after reading this article which really spoke to me - we can't read / watch / consume everything. You have to be selective. Which leads on nicely from the above. What is your go-to genre? What style of book is always a winner for you? I wrote about this back in 2015 when I found out - through trial and error, often reading 'must-reads' and hating them - that I really like a pacey thriller. You know the type; Gone Girl, In To The Darkest Corner, I Let You Go. And this doesn't mean I only read thrillers - see next point! - but it does identify that I like a book with a bit of mystery, something a little fast paced and definitely something with a strong story line. I cannot get on board with books that detail the minutiae of the everyday. As I say, this doesn't mean you can only ever read said genre! Last year I really got in to reading non-fiction - as I spoke about in this round-up post - and have loved having something factual to read alongside fiction. My interest in social commentary, feminism and inequality has really driven this and I've found myself drawn to the 'smart thinking' and 'biography' sections in Waterstones which I had never visited prior to my non-fiction reevaluation of 2017 (lols). Avoiding this state of literary inertia is key to galvanising your reading habit. An obvious, but important one to note. In the age of the smartphone addiction epidemic (according to some, at least) it has becoming increasingly difficult to cut off distractions. But turning your phone on to flight mode, putting it in a different room or - dare I say it - turning it off, will provide that extra bit of focus so many of us need. And I get it; moving from the glossy, ever-communicative interface of your iPhone to a stripped-back paperback can be daunting. I think we often underestimate the impact our constant phone use has on us, and whilst that previous sentence may sound OTT I think for many it's true. At least subconsciously. Reflecting on this is so important; is it FOMO? Or mindless, endless scrolling? Reading can be a great vehicle for minimising phone dependency. Be it at bed time, your lunch break, or a hour after work before dinner - it may seem extravagant but this designated time can become a part of your reading routine. I try to read every night in bed for twenty minutes or so, and at the weekend I try and put aside an hour or so each day. 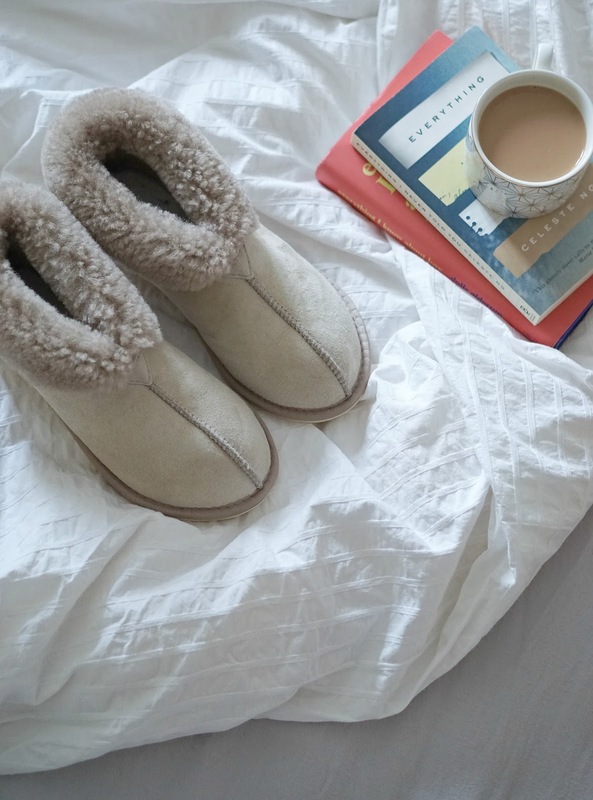 There is nothing more relaxing than taking to the sofa in your comfiest clothes, warmest slippers (see pictured my Women's Sheepskin Boots* which make me feel as though my feet are submerged in tiny clouds) and a cuppa, and knowing there is nothing for you to be doing but reading and relaxing. The new RnR! Of course, time doesn't always allow, but when I'm sticking to it I reap the benefits. Not only in being able to read more, but in helping switch off before sleep and maintaining a healthy level of zen. Taking time out to read when I'm feeling particularly stressed or anxious is really so effective in helping me feel more in control. What do you do to read more? I loved the Malory Towers books! I find it odd that I used to love reading as a child, but find it really difficult to both get into and stick with a book once I start these days. I'm quite a slow reader, so I guess I get quite frustrated. But, in a bid to read more, I've set up a reading nook at home in the bedroom. There's no TV in there and I leave my phone in the living room. I also read on a kindle. I bought a few on my phone, but the opportunity for distraction was too great. If I know I want to get into a book, but think I may find it tricky, I might try the audio version, as I walk a lot too and from work these days too. Definitely think I'm getting through more by trying these things! I love reading and I barely find time to do it. I always find distractions and never really give myself a space to just unwind and lose myself in a good book! Great post sweet!